Are you ready to learn about some Sleep Physiology? I sure hope so because that is what this study guide is all about. It also covers the Disorders of Sleep that come directly from Egan’s Chapter 33, so be sure to have your thinking cap on and ready to go. As a Respiratory Therapy student, you will be required to know all about Sleep Physiology and how it affects the cardiopulmonary system. The good thing is, this study guide is loaded with practice questions that can help you do just that. Are you ready to get started? If your RT program is like mine, you probably use the Egan’s Workbook. It’s a great workbook that can be helpful at times. The problem is, it takes way too long to look up all the answers. It tends to be more busy-work than anything else. 1. What is the circadian rhythm? It is the most familiar biologic rhythm. As humans, it serves as our 24-hour internal biologic clock. 2. What is NREM sleep? 3. What is REM sleep? Onset of confusion and agitation that affects people with dementia. It is the inability to fall asleep or remain asleep. 6. What drugs disrupt sleep? Alcohol, amphetamines, antidepressants, beta-blockers, bronchodilators, caffeine, decongestants, narcotics, and steroids. 7. What drugs cause excessive daytime sleep? Antidepressants, antihistamines, beta-blockers, and narcotics. When you get enough sleep at night but still cannot stay awake during the day. It is caused by medical conditions, CNS damage, kidney, liver or metabolic disorders as diabetic acidosis and hypothyroidism. A disorder of excessive daytime sleepiness caused by lack of chemical hypocretin in CNS that regulate sleep. 10. What is sleep apnea? Frequent periods of apnea during a sleep. A behavior that may interfere with sleep and may even occur during sleep. Physical events such as movements or experiences that are displayed as emotions, perceptions or dreams. 12. Insufficient sleep is a public health epidemic and the Center for Disease Control has called for what? The continued public health surveillance of sleep quality, duration, behaviors, and disorders to monitor for sleep difficulties and their health impact. 13. What is the most important biorhythm? 14. What happens to the natural circadian rhythm as people age? It is less responsive to external stimuli, such as changes in light during the day. 15. What is the result of endogenous changes in the diminished production of melatonin? 16. What kind of sleep declines with aging? REM sleep declines with aging and is a “critical state for sleeping elders” when the brain replenishes neurotransmitters. 17. What are the most notable age-related sleep changes? An increase in the number of nighttime awakenings and lower sleep efficiency. 18. What is the most common sleep disorder worldwide? 19. What is associated with about half of individuals with dementia that experience sleep dysregulation? Agitation, wandering, co-morbid illness, primary sleep disorders, or medications used to treat dementia. 20. What are some behavior techniques to enhance sleep for those with AD? Sleep hygiene education, daily walking, and increased light exposure. 21. How do caregivers of dementia suffer with their sleep? Caregivers also experience poor sleep quality, leading to stress and health problems. 22. What are the contributing factors of poor sleep and sleep disorders? Pain, chronic illness, medications, alcohol use, depression, and anxiety which is the important complete assessment data. 23. What are some nonpharmacologic interventions of sleep? 24. The use of over-the-counter sleep aids and prescription sedatives and hypnotic medications is increasing in the United States. What drugs specifically used for sleep? Benzodiazepines represent 17-23% of drugs prescribed to older adults and is one of the most abused drugs, along with opiates, in the older population. 25. What sleep disorder affects approximately 25% of older adults? 26. What is related to untreated obstructive sleep apnea? Right heart failure, cardiac dysrhythmias, stroke, type 2 diabetes, and even death. 27. What predisposes older adults to OSA? Age-related decline in the activity of the upper airway muscles, resulting in compromised pharyngeal patency. 28. How can we treat OSA? 29. What happens with Non-rapid eye movement (NREM) sleep? The frequency of brain waves and vitals decline. It also has 4 stages. 30. What is Stage 1 sleep? The eyes close and relaxation begins which is known as a drifting sensation but the person can be awakened immediately. 31. What is Stage 2 sleep? 32. What is Stage 3 sleep? Sleep deepens, and skeletal muscles are very relaxed. Takes about 20 minutes to get to this stage after stage 1 begins. 33. What is Stage 4 sleep? It is called slow wave sleep and vital signs reach their lowest level in this stage. It can be hard to awaken. Bed-wetting and sleep-walking occur in this stage. 34. How much sleep do we need? Most people 7-8 hours of sleep. 35. How many REM cycles do we have each night? 36. How many times do we wake up per night? Normally it’s 4-5 but we don’t remember because it’s <20 seconds. 37. What are the 4 EEG brain waves? Delta <4Hz, Theta 4-8 Hz, Alpha 8-13Hz and Beta >13 Hz. 38. Which waves are seen in deep sleep? 39. What are the 3 main sleep stages? Wakefulness – ARAS and hypothalamus, REM stage – Brain on, Body off and Non-REM stage – Brain off, body on. 40. How does the EEG look in REM sleep? Aroused EEG pattern which makes muscle atonia, saccadic eye movements (thinking), paralyzed body (EMG activity) and dreaming. 41. How long is a sleep cycle? 42. How does EEG look in REM sleep? Beta waves, low voltage and saw tooth pattern. 43. What are the 4 stages of non-REM sleep and what happens with the brain waves? Stage 1 which is light sleep where alpha disappears with slow waves and theta appear. The stage 2 where K-complexes and sleep spindles are seen 12-14Hz. The stage 3 and 4 has deep sleep with delta waves 0,5-3Hz. 44. What are signs of sleep deprivation? Cognitive function with only 5 h of sleep is the same as a “legally drunk” man. Increased lymphocytes, BP and cortisol. Decreased glucose tolerance, and prefrontal cortical activity. 45. What are signs of REM deprivation? It is important for complex learning and to “clear out” the brain from the previous day. 46. What is the function of Melatonin? 47. What are the two main groups of primary sleep disorders? Dyssomnias which is the abnormal quality, timing or amount of sleep and parasomnias which is the abnormal episodes during sleep. 48. What are 3 causes of secondary sleep disorders? (1) Medical – which are the COPD, asthma, and chronic pain. (2) The second cause is drugs – which are caffeine, nicotine, amphetamine. (3) Last is psychiatric – which are the mood and anxiety disorders. 49. What are some examples of dyssomnias? Insomnia, hypersomnia, narcolepsy, breathing disorder such as sleep apnea and circadian rhythm sleep disorder which happens with people with jet lag and shift workers. 50. How is insomnia treated? Short-acting BZD, Mirtazapine, SSRI, antihistamines, and melatonin. 51. Name one sleep-related movement disorder? 52. What is restless leg syndrome? Irresistible urge to move with disagreeable leg sensation. Worse at rest, in the evening and at night. Partially relieved by activity. And interferes with sleep. 4% of men and 5-6% of women. Periodic limb movement which occurs in 80% of patients with RLS. 55. What are the symptoms of PLM? Insomnia and excessive daytime sleepiness. Many small awakenings during night. 56. What is the treatment for restless leg syndrome? 57. What is hypersomnia, and what is it caused by? Excessive daytime sleepiness, due to insufficient sleep syndrome, depression, neurological disorders, and drug side effects. 58. What are the symptoms of narcolepsy? Imperative sleepiness with strong irresistible desire for sleep “sleep attacks”, lasting minutes, refreshing, occurs at intervals through the day. 59. What is a hypnagogic hallucination? Vivid and dream-like experiences that occur at the start of end of sleep. 60. What is sleep paralysis? Unable to move during sleep/wake transition, the patient is fully oriented, but there is persistent imagery from a dream. 61. What is the treatment of narcolepsy? Modafinil, Methylphenidate, and Sodium Oxybate. 62. Why do long, vivid dreams sometimes occur near the morning? Morning is when REM sleep lasts the longest, and REM is when one experiences the most dreaming. 63. What is recurrent hypersomnia? 64. What are the symptoms of obstructive sleep apnea syndrome? dry mouth, sore throat, headache in the morning. 65. How do you diagnose obstructive sleep apnea? Overnight sleep study – airflow, blood O2 saturation, respiratory effect. 66. How can we treat OSA? Weight reduction by 10%, surgical therapy – soft palate reduction and tonsil surgery, and CPAP with a nasal mask. 67. What are the 4 parasomnias? 68. What are some examples of non-REM parasomnia? Night terror, sleep walking and confusional arousal. 69. What are some examples of REM sleep parasomnia? Isolated sleep paralysis and nightmares. 70. What are night terrors? Recurrent episodes of abrupt awakening, most commonly in the first third of the night, usually with a scream. Intense fear and autonomic signs. And unresponsive to comforting and no details can be recalled. 71. What is the cause of night terrors? Incomplete arousal from NREM sleep which is genetic and environmentally influenced. 72. What is the prevalence of night terrors? 30-40% have at least 1 episode, mostly at 2-3 years. It is less in adolescence and can return in 20s-30s. Automatic behavior at night, the sufferer is unresponsive to his surroundings and other people, he most commonly walks around. Can also include other behavior such as dressing, washing, making tea, and arranging possessions. 74. What is the prevalence of sleepwalking? 15-20% in children and 3-4% in adults. 75. What is the cause of sleepwalking? Sleep deprivation, stressful events, moonlight, alcohol, and moving. Distressing dreams where the patient is oriented and can vividly describe their dream contents. They are more common in patients with depression and PTSD. 77. What is REM sleep behavior disorder? Violent, short duration complex behavior at night. Often several episodes per night, they can wake the person. The subject remembers the dream (vivid, violent, unpleasant). 78. What is the prevalence of REM sleep behavior disorder? Mostly in men >50 years. 79. What is the treatment for REM sleep behavior disorder? Antidepressants can make it worse. Treatments are clonazepam, agomelatine, melatonin, pramipexol, and clonidine. 80. What are some common worsening factors of parasomnias? 81. What are circadian rhythm disorders? Disturbances of normal sleep-wake rhythm. 82. What are the symptoms of jet lag? general malaise and stomach upsets. 83. In which direction is jet lag worse? Eastward travel (because the internal rhythm is slightly longer than 24h, so lengthening the day after westward travel is easier). 84. What are brain waves? It is the billions of impulses that pass through the brain continuously show up on monitoring equipment. 85. What does EEG stand for? 86. What are the types of brain waves? Alpha, Beta, Theta, and Delta. 87. What are alpha waves? It is the most common brain waves when one is awake but in a relaxed state with eyes closed. Once the person either falls asleep of opens their eyes to focus on a task, these waves disappear. 88. What are beta waves? Typical brain waves in a person that is conscious and alert, thinking and receiving sensory input. 89. What are theta waves? Most common brain waves in children but disappear in adults. Suggests emotional stress or certain brain abnormalities form since they leave. 90. What are delta waves? Brain waves that are normally seen only when a person is asleep. If seen in an awake person, could have a brain abnormality. The state of unconsciousness in which adequate stimulus can arouse and wake the person to consciousness. The brain is still active and processing information during sleep. 92. What does it mean to be awake? To be conscious, alert, attentive, and mindful of the surroundings. 93. What is a coma? A state of unconscious, but even intense stimuli will not wake the person. 94. What are the types of sleep? Non-rapid eye movement (NREM) and Rapid eye movement (REM). 95. What is NREM sleep? Non-rapid eye movement, a type of sleep that occurs with the first hour of unconsciousness. 96. What is Rapid eye movement sleep? It is so named because the eyes experience fluttering movement. It occurs after NREM-4, and all around about 90 minutes after NREM sleep begins. 97. When do nightmares occur? 98. When does dreaming occur? In REM sleep, not including nightmares. 99. When does a person experience skeletal muscle paralysis? 100. Why do long, sometimes vivid dreams occur near morning? Morning is when REM lasts the longest, and REM is when one experiences the most dreaming. 101. Has the available evidence shown that bilevel pressure is associated with better patient compliance than the conventional CPAP? No, patients prefer CPAP over BiPAP. 102. Does central sleep apnea occur more often than obstructive sleep apnea? No, obstructive sleep apnea occurs more often. 103. The definition of sleep apnea uses what criteria for defining an episode of apnea? 104. How does CPAP improve breathing in the patient with OSA? Pneumatic splinting of the upper airway. 105. In what way do BiPAP units differ from CPAP units? BiPAP applies different pressure levels on inspiration and exhalation. 106. Do medications work for people with sleep apnea? No, medications have proved ineffective for most patients with sleep apnea. 107. Do oral devices help patients with mild cases of sleep apnea? Yes, oral devices may prove useful for cases of mild obstructive sleep apnea. 108. Do patients with more severe levels of OSA usually need higher levels of CPAP to eliminate the apnea episodes? No, CPAP levels can only be raised so high. 109. What is the success rate of Uvulopalatopharyngoplasty? It is generally less than 50%. 110. What are the criteria to define hypopnea? A 30% decrease in airflow and 4% oxygen desaturation. 111. What is believed to be the cause of systemic hypertension in patients with sleep apnea? 112. What is considered to be the major problem with the use of CPAP in patients with obstructive sleep apnea? 113. What is the amount of CPAP that is typically required to abolish upper airway obstruction in patients with OSA? 7.5 to 12.5 cm H2O. 114. What is the name of the respiratory pattern where a crescendo-decrescendo pattern of hyperpnea alternates with periods of apnea? 115. What is the primary cause of obstructive sleep apnea? A small or unstable pharyngeal airway. 116. What percent of the adult population is believed to have obstructive sleep apnea? 2% to 4% and that number is rising each year. 117. What term is used to describe a significant decrease in airflow during sleep but not a complete cessation of breathing? 118. What term is used to describe CPAP units that use a computer to adjust CPAP levels as needed by the patient during sleep? 119. What value for the apnea-hypopnea index (AHI) is consistent with moderate obstructive sleep apnea? 120. Which of the following behavioral interventions is least useful for the treatment of sleep apnea? 121. Which of the following characteristics is not typically associated with sleep apnea? 122. Which of the following characteristics is not typically associated with sleep apnea? 123. Which of the following conditions are associated with central apnea? Congestive heart failure, primary central nervous system lesions, high-altitude hypoxemia. 124. Which of the following conditions is NOT associated with untreated obstructive sleep apnea? 125. Which of the following factors has been shown to positively correlate with obstructive sleep apnea? Obesity of the upper body. 126. Which of the following is NOT a common side effect of positive-pressure therapy? 127. Which of the following is NOT a parameter used to confirm the metabolic syndrome associated with obstructive sleep apnea? 128. Which of the following medical therapies is considered first-line treatment for obstructive sleep apnea (OSA)? 129. Which of the following parameters is NOT typically monitored with a polysomnogram? 130. Which of the following physical exam findings is associated with obstructive sleep apnea? 131. Why should the patient with obstructive sleep apnea not use alcohol? Alcohol decreases the arousal threshold. So there you have it. 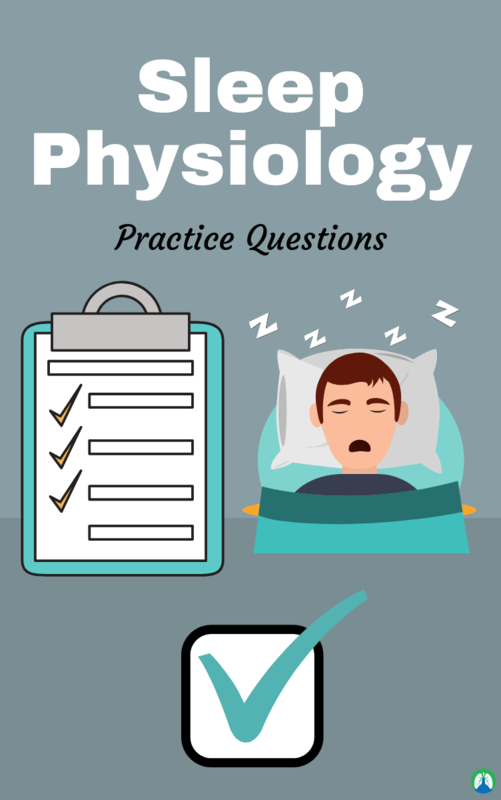 That wraps up our study guide on Sleep Physiology and how it affects the cardiopulmonary system. I hope that these practice questions were helpful for you and I’m confident that if you go through this information until it stick, you will ace your exam whenever that time comes.